This article is a short summary of Super Mario Maker. Super Mario Maker is a level designing game that was released for the Wii U in 2015. The game was developed as a spiritual successor to Mario Paint, and allows players to build their own courses in the style of one of several Super Mario games, based on the course creation tool developed by Nintendo for 2D Super Mario games. The game was released as part of the Super Mario Bros. 30th Anniversary, and was sold alongside an art book. Anyone can make it. Everyone can play it. Advance through four Mario game styles! Take on crazy pre-made courses! The Mario™ experience of your dreams is here and is bursting with creativity... including yours! Play a near-infinite number of inventive Mario levels from Nintendo and players around the world. Or even make your own levels on the Wii U™ GamePad controller. What was impossible in past Mario games is now impossibly fun. Let your imagination run wild! Simply drag and drop elements to create pure Mario magic. Break the usual Mario rules by layering enemiestraps, and items to create unexpected twists, like Piranha Plant-shooting cannons, power-up-tossing Lakitus, or even Hammer Bros. riding on Bowser™ while bouncing on trampolines. Switch between 4 Super Mario Bros.™ themes–from the 8-bit art of the original to New Super Mario Bros.™ U–and enjoy the action that each provides. Ready to play instead? There's always something new to play, with Nintendo and players like you continuously adding more stages. 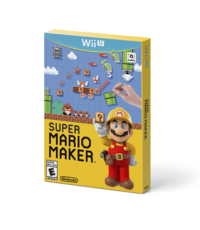 Whether playing or creating, Super Mario Maker™, is your ultimate Mario playground! Players can create their own 2D Super Mario courses by dragging elements onto the stage with the Wii U GamePad and adjusting them by either. Players can create courses in the style of Super Mario Bros., Super Mario Bros. 3, Super Mario World, and New Super Mario Bros. U, all of which recreate their respective games' gameplay mostly faithfully. The properties of various enemies and objects can be adjusted by shaking them or placing other items or objects on them. While some assets are game-exclusive, certain assets have been created for graphical styles that they did not debut in (e.g. a Super Mario Bros.-style Chain Chomp, an enemy that debuted in Super Mario Bros. 3). New powerups also appear, such as the Weird Mushroom, which gives Mario a distorted appearance and Luigi's physics, and the Mystery Mushroom, which allows Mario to transform into one of several other characters by tapping an amiibo on the Wii U GamePad, though these are restricted to the Super Mario Bros. graphical style. Players are able to share their courses with the rest of the world and download courses from other players, as well as post Miiverse comments on other players' courses at any time by pausing or after completion and can also "star" them. Uploading is at first limited to 10 courses, but this can be increased if other players star their courses. Players can also upload a Super Mario Bros.-style "world" of four courses for players to complete. In addition, between created courses and downloaded courses the player can store up to 120 courses, while the game comes with over 60 sample courses, and the 10-Mario Challenge, in which players are given ten lives to clear eight sample courses. Also available is the 100-Mario Challenge, in which players must clear a set of player-created courses within 100 lives. 1.01 September 10, 2015 Changes the unlock system, adds an easter egg to course creation, gameplay adjustments. 1.10 September 23, 2015 Gameplay adjustments. 1.20 November 4, 2015 Adds the ability to place checkpoints, adds power-dependant items, adds sections for event courses and official Nintendo courses, adds a more difficult Gnat Attack minigame. 1.21 November 13, 2015 Gameplay adjustments. 1.30 December 18, 2015 Adds new course elements, changes some graphics, gameplay adjustments. 1.32 January 27, 2016 Fixes an issue with Create mode. 1.40 March 9, 2016 Adds new course elements, adds "Super Expert" difficulty to 100 Mario Challenge", adds additional Mystery Mushroom costumes, additional features added to the Super Mario Maker Bookmark site, gameplay adjustments. 1.41 March 18, 2016 Gameplay adjustments. 1.43 May 19, 2016 Adjusts the Star Ranking list in Course World, adds "Super Expert" filter for course searching. 1.44 July 21, 2016 Commenting on courses no longer gives it a star, changes the conditions under which the fly appears in the course creator, gameplay adjustments. 1.45 November 30, 2016 Fixes a number of issues. 1.46 April 27, 2017 Issue fixes. September 5, 2017 Fixes an issue that causes the text in the digital manual to not display correctly, issue fixes. 1.47 November 7, 2017 Disables the ability to post new Miiverse comments on a stage and view existing comments, issue fixes. KOR: August 3, 2017 A port of the original game for Nintendo 3DS with new features. ↑ Super Mario Maker 1.01 patch removes day wait for usable items. Wii U Daily (September 10, 2015). Retrieved September 10, 2015. ↑ Super Mario Maker Gets A Small Software Update. My Nintendo News (September 24, 2015). Retrieved September 24, 2015. ↑ Software Update Brings Mid-Level Checkpoints And New Courses To Super Mario Maker. My Nintendo News (October 27, 2015). Retrieved October 27, 2015. ↑ Nintendo Direct 3.3.16. YouTube (March 3, 2016). Retrieved March 4, 2016. ↑ Super Mario Maker: new update available (Wii U: Ver. 1.45 / 3DS: Ver. 1.02). Perfectly Nintendo (December 1, 2016). Retrieved December 1, 2016. ↑ Super Mario Maker update out now (version 1.46 Wii U, version 1.03 3DS). Nintendo Everything (April 27, 2017. Retrieved April 28, 2017. ↑ Super Mario Maker update out now (version 1.46). Nintendo Everything (September 5, 2017). Retrieved November 12, 2017.